The three wooden troughs included in this research are considered to have been used for the heating of water or other liquids, most likely for food preparation, washing, or other 'domestic' chores. Infra-red imaging of each vessel has highlighted scorch marks on the interior, consistent with a process known as hot stone boiling. In this technique a volume of liquid is added to the vessel, and stones heated in a nearby fire are placed in the liquid. The quenching of the stones in the liquid raises the temperature such that the water eventually begins to boil. The scorch marks visible on the interior bases of these objects may indicate areas where an extremely hot stone has been left in place for too long- it seems likely that the hot stones were agitated or moved around within the liquid to prevent such scorching from occurring. None of the troughs included in this research have been radiocarbon dated, but some work has been done to stylistically date types of Irish vessels. The Grainger vessel is perhaps one of the earliest examples of a two-handled wooden vessels of similar type in Ireland. While more rounded than oblong in shape, the twin carved handles on this cauldron-like vessel are somewhat reminiscent of those on trough 473.1932 (Earwood 1991: 45, Fig.21). The Grainger vessel, part of the archaeological collection at the Ulster Museum, has been stylistically compared with Bronze Age metal cauldrons found in Ireland, and radiocarbon dating confirms a date between 1055 and 795 B.C. (Earwood 1989) . Another cauldron-like wooden vessel, but with carved wooden handles comparable with those on trough Wk 285 was found in Clough bog, between Lisbellaw and Enniskillen, Co. Fermanagh (Mahr 1934: 20), and has been radiocarbon dated to between 663 to 363 BC (Earwood 1989). While comparative stylistic dating appears to push the origin of these vessels back into prehistory, it could be argued that stylistic comparison of isolated features such as handles is not a secure process. The troughs included in this study vary considerably in shape and size to the vessels with which Earwood makes stylistic comparison (shown in the images above). Indeed, Earwood (1993,50-52) cautions that wooden vessels of this type are difficult to stylistically date, because they are rarely distinctive. Perhaps for user made objects such as these, making the handles in either of the three ways found on these vessels was the simply the most practical or traditional way of doing so. As has been demonstrated on the spade section of this website, the material culture in the Gaelic region of western Ulster included other object designs that could be considered archaic. Earwood (1993, 237) points to a curious decline in the technology associated with wooden vessel production in rural Ireland from the twelfth to the seventeenth centuries. "They did not sieve the flour, but rather, mixed it in a basin with water, chaff and all, and cooked it with fire-heated stones." 18th century cast iron cooking pots. From the Darby collection, Ironbridge Museum, Coalbrookedale, England. 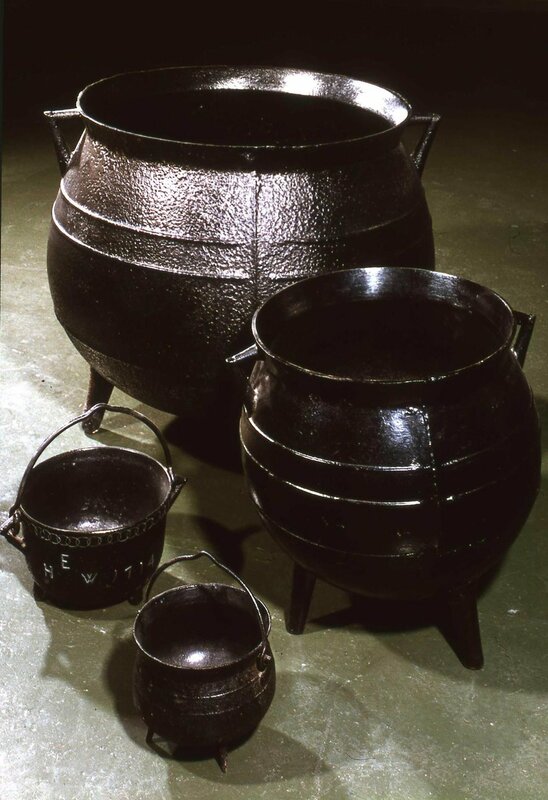 Given the prevalence of the iron three legged cooking pot in Irish cultural memory, it seems difficult to imagine a time when iron cooking vessels were not widely available in Ireland. Iron cookware is to some extent part of the symbolism of Irelands relationship with the cosy hearthside, the potato, and by association with the Irish great famine. Yet investigation of the archaeological record indicates that iron cookware was relatively uncommon outside of urban centres in medieval Ireland, and was more typically associated with high status contexts than with those lower down the social ladder. Indeed, the three legged cast iron cooking pots closely associated with Irish folk traditions may only have become widely available after an efficient means of mass production was established by Abraham Darby at Coalbrookedale in Shropshire, in the early 18th century. A 19th century type of flat bottomed iron pot known in Ireland as a 'bastible', may have been so-called because pots of this type were produced at Barnstaple in Kent. The early sand casted iron pots produced at Coalbrookdale mirrored medieval three legged designs, and it is perhaps unsurprising that the antiquity of these vessels is misunderstood. Earwood, C. (1989) Radiocarbon Dating of Late Prehistoric Wooden Vessels. The Journal of Irish Archaeology 5, 37-44. 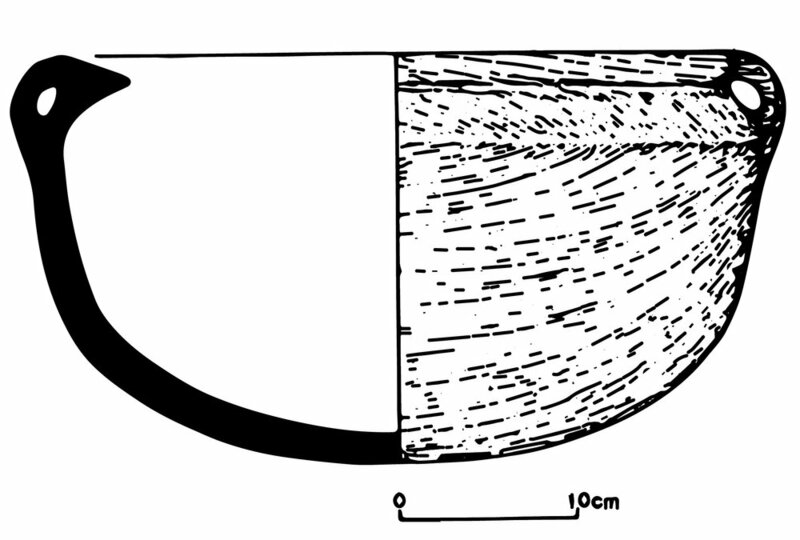 Earwood, C. (1991) A Radiocarbon Date for Early Bronze Age Wooden Polypod Bowls. The Journal of Irish Archaeology 6, 27-28. Earwood, C. (1993) Domestic Wooden Artefacts in Britain and Ireland from Neolithic to Viking Times. University of Exeter Press. Lucas, A. T. (1960) Irish Food Before The Potato. Gwerin: A Half-Yearly Journal of Folk Life 3 (2), 8-43. Lucas, A. T. (1965) Washing and Bathing in Ancient Ireland. The Journal of the Royal Society of Antiquaries of Ireland 95 (1/2), 65-114. Mahr, A. (1934) A Wooden Cauldron from Altartate, Co. Monaghan. Proceedings of the Royal Irish Academy. Section C: Archaeology, Celtic Studies, History, Linguistics, Literature 42, 11-29. Moryson, F. (1735) An history of Ireland, from the year 1599 to 1603: With a short narration of the state of the kingdom from the year 1169. To which is added, A description of Ireland. Printed by S. Powell for G. Ewing. O'Néill, J. (2003) Lapidibus in igne calefactis coquebatur: The Historical Burnt Mound 'Tradition'. The Journal of Irish Archaeology 12/13, 79-85.